Colour: Colourless (impurities can cause Calcite to take on many colours). Calcite is one of the most abundant minerals in the Earth's crust. It is a significant rock forming mineral. Though calcite is commonly almost pure calcium carbonate, calcium can be replaced by manganese, magnesium and iron. Thus Dolomite is a carbonate of both calcium and magnesium. Calcite is a major component of limestones, and forms the shell of a large number of marine creatures such as corals, molluscs and sponges. 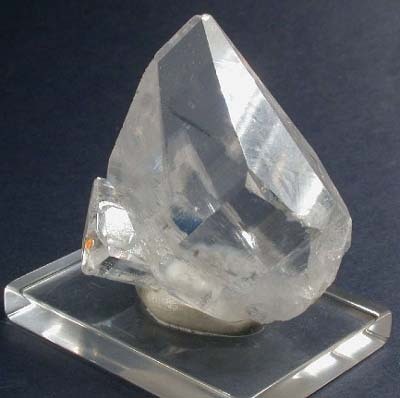 The picture shows a nice, clear, scalenohedral crystal of Calcite from Nikolaevskiy Mine, Dal'negorsk, Russia.